Code editor powered by Vuejs and browserify Ace. 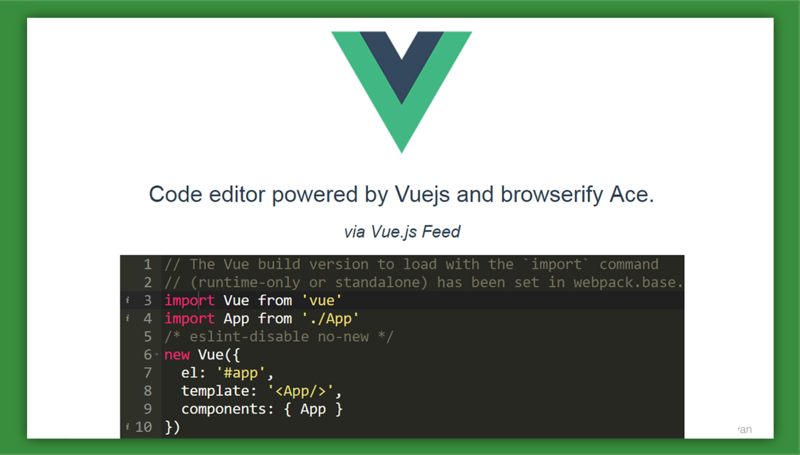 - Vue.js Feed Code editor powered by Vuejs and browserify Ace. This project is created with the power of the Ace code editor, as another component for the Vue Bulma UI Components. You can browse its repositories to find more useful vue related projects. Bulma is a modern CSS framework based on Flexbox. Documentation. Define any properties for your editor to customize as you see fit. For docs and other information visit the Ace page. Vue Bulma Brace is available on GiHub.